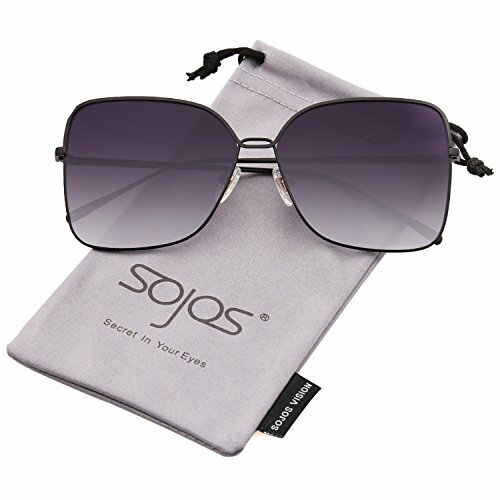 UV400 PROTECTION FOR YOUR EYES - SojoS Vision anti-glare lenses can block 100% of both UVA and UVB radiation. UV400 rated sunglasses is essential to filtering out sunlight reflected glare and protecting your eyes against long term UV damage when you go out. OVERSIZE STYLISH DESIGN - Oversized fashion frame is today's trend. The super fashion design and the excellent technology enables the glasses to be well attached to all kinds of faces, fitting for large to small heads. This oversize stylish sunglasses is a good choice for fashion and stylish accessory, which can go with various of features and clothings. SOFT SILICONE NOSE PADS - SojoS Vision silicone nose pads can adapt to different nose shape. Reduce the burden on your bridge of the nose and bring you a perfect practice. PRODUCT DIMENSION - Lens Width: 63mm(2.48inches) | Lens height: 55mm(2.17inches) | Temple Length: 145mm(5.71inches) | Nose Bridge: 13mm(0.51inches). 100% MONEY BACK GUARANTEE - SojoS ensures all our customers with 100% Money Back Guarantee and Lifetime Breakage Warranty for our product. In case of any broken issues, please contact us without hesitation. We will provide the best service until our customers are satisfied. You have no risk to try! If you have any questions about this product by SOJOS, contact us by completing and submitting the form below. If you are looking for a specif part number, please include it with your message.